Oil’s price has pulled back sharply, but the chart suggests it’s not a change of the uptrend, according to Daryl Guppy. The longer-term trading band target is near $76 and potentially higher, he writes. The NYMEX oil price has pulled back sharply from $72 to around $66, but that is taking place within the environment of a well-established uptrend. In fact, the chart suggests that the pullback is not a change of trend, but it’s instead just a temporary retreat. There are three features that support the conclusion. The first feature is the long-term support level near $65. That acted as a resistance level in January and again in April. Oil has a well-established pattern of moving in trading bands. The standout feature on the chart is the strong support level near $43 and resistance near $54. That makes the trading band around $11 wide and gives an upside projection target for the trading band near $65 which has been achieved and exceeded. Applying the same trade band projection methods gives a long-term target near $76. The second feature is the location of the uptrend line. The uptrend line starts from the anchor point near $43 from June, 2017. The line has successfully acted as a support level and provides a good definition of the rising trend. It has been tested several times so it acts as a second support feature with a current value near to the value of the support level around $65. The third, and perhaps most important feature, is shown with the Guppy Multiple Moving Average indicator. The long-term group of averages is well separated and shows strong and consistent investor support for a rising trend. When prices retreat, investors enter the market as buyers. That is the most consistent trend support behavior shown in the GMMA indicator on the oil chart in nearly a decade. The degree of separation between the long-term and short-term GMMA is also steady. The consistent degree of separation is a characteristic seen with stable trends. That again confirms trend strength and stability and suggests that the current retreat is temporary rather than the beginning of a trend change. The short-term group of averages — which reflects the way traders are thinking — shows a low level of volatility. That group is not characterized by rapid compression and expansion, which shows that traders are buyers whenever the price falls. That tells us traders are also confident that the uptrend will continue. 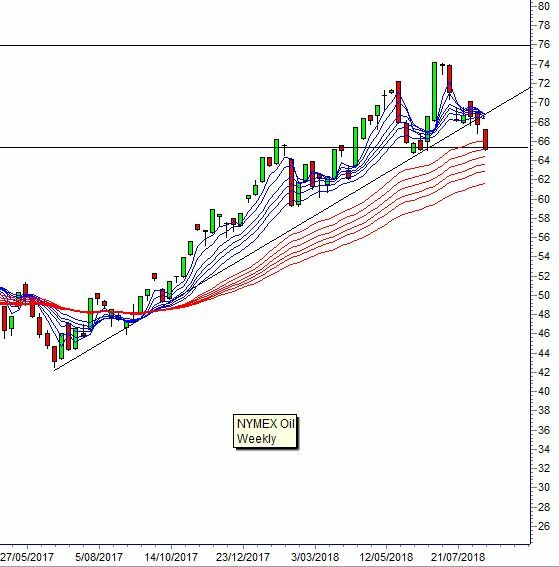 Those support features and the trend strength features all suggest that the price of oil is experiencing a temporary retreat. The longer-term trading band target is near $76 and potentially higher. It is higher because the $76 level has no history of providing strong support or resistance. This entry was tagged ANTSYSS, CNBC, GMMA, NYMEX, oil price. Bookmark the permalink. The May 2015 high stood as a line in the sand for oil. Crude oil rises to the highest level since 2014 as inventories and rig counts in the U.S. decline. Brent is flirting with $70 per barrel. Economic data is supportive of oil. On June 21, 2017, things were looking pretty bleak for the crude oil market. Critical technical support stood at the November 2016 low at $42.20 per barrel on the nearby NYMEX futures contract, and the price fell through that level to a low of $42.05. 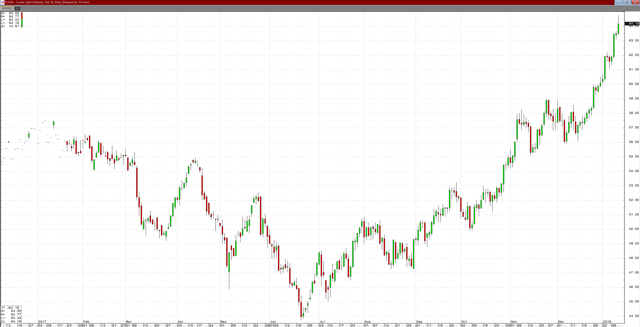 Many market analysts were calling for a test of the $40 level while others believed that the energy commodity was on its way back to a thirty handle. The spring OPEC meeting disappointed many bulls who were hoping for an extension of production cuts through all of 2018 and all they got were three more months to the end of Q1 2018. 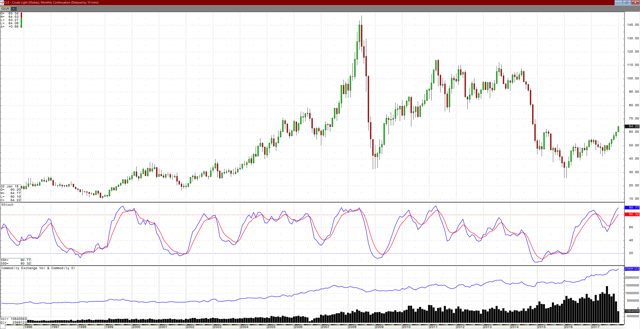 However, the price of oil found a significant bottom at the June 21 low, and since then it has been off to the races and a one-way bullish street for the energy commodity. In early August, the price was back at the $50 level, and after a correction down to $45.58 in late August, the higher low took NYMEX crude on a bullish journey that culminated in a new high for the year in late October and early November. Crude oil continued to move to the upside and finished 2017 over $60 per barrel, a level not seen since 2015. Crude oil rose from its low for 2017 to its high over a period of five months, and it kept on going. As the monthly chart highlights, crude oil rose to over $60 per barrel at the end of 2017 and the next level of critical resistance stood at $62.58 per barrel the May 2015 high. NYMEX futures reached that level when they were on their way down from highs of over $107 in June 2017, and the price was the result of a dead cat bounce that eventually took the energy commodity to its February 2016 low at $26.05 per barrel. Crude oil has been moving higher alongside rising open interest which provides a degree of technical validation to the bullish trend. 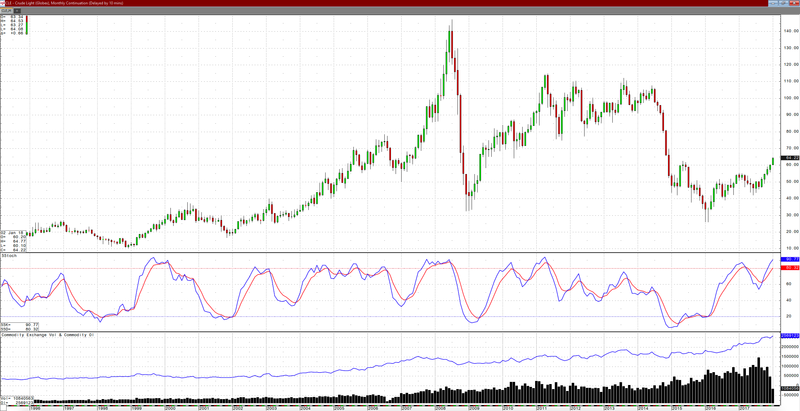 While the energy commodity has moved into overbought territory on the monthly chart, the price took out the area of technical resistance last week. This entry was tagged Brent, crude oil, energy commodity, NYMEX, OPEC. Bookmark the permalink.